Your speech was most inspiring and motivational to Dr. Payton and the Association. For thirty five (35) minutes, you took us on a journey that has given Tuskegeeans and the public, a new perspective on the philosophy and wisdom of our great founder, Dr. Booker T. Washington. You enlightened the audience while referencing Dr. Washington's wisdom to today's society. It was a wonderful closing to our four (4) day convention. 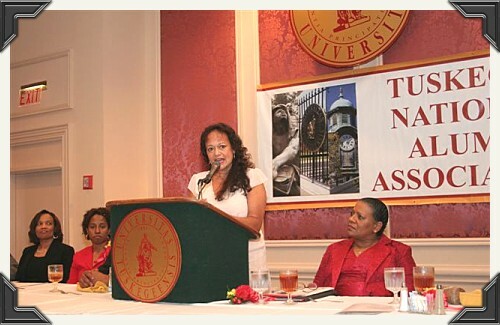 Tuskegee National Alumni Association, Inc.
You cannot imagine the genuine excitement my colleagues and I felt at meeting you for the first time, the great granddaughter of one of America's most inspirational leaders, Booker T. Washington. Subsequent to that meeting, it was with great pleasure that I invited you to speak at the Heritage Foundation on the occasion of the birthday of your great-grandfather. It has been my privilege to be present at many programs at the Heritage Foundation over the years, but I must say that your presentation on the life and legacy of Booker T. Washington was one of the most moving and uplifting that I have witnessed in quite some time. Your lecture was informative and yet presented with real affection and respect, and the audience received it with great enthusiasm. In fact, your presentation was so compelling and well received that the Heritage Foundation has included it as part of its formal lecture series. We are grateful that you have seized the moment and chosen to tell the Booker T. Washington story to generations of people who may not know of this man who was so wise and courageous. The richness of his story told by a member of his own family is compelling and instructive even today. On behalf of the Clark Atlanta University English Department, I'd like to express our deepest appreciation for your participation in our 27th annual Writer's Workshop Conference. Your beautiful, moving keynote speech on the life-work of Booker T. Washington was the highlight of the conference, and everyone who was fortunate enough to be there came away with a renewed appreciation of his achievements. Moreover, since our students hear very little about Booker T. Washington during their college experience, your participation in our conference was vital to its success, and your eloquence captured the hearts and minds of students and faculty alike. On a more personal note, I have felt from the beginning that I was spirit-led to your website, and the way things worked out confirm my impression. Godspeed in your work for BTWIN. Gloria is a powerful, compelling and engaging speaker. She speaks on the topics of faith, freedom, and economic empowerment, as well as principled entrepreneurial endeavors. At the same time she sets out, with great clarity, the incredibly inspiring and uplifting truths of the life, the legacy, and the liberating philosophy of her great grand father, Booker T. Washington. I encourage you to invite Gloria Jackson to speak at your next event. Prepare to become spellbound and inspired, with others, as she speaks. On behalf of the Black Employees Association (BEA), we heartily thank you for the inspirational and uplifting speech you gave during our Black History Month celebration. It was both informative and educational, and I particularly enjoyed how you bridged the historical context of Booker T. Washington's life and principles with today's contemporary issues. More people should hear your presentation, especially young people. Again, thank you for an outstanding speech. The BEA looks forward to continuing our relationship with you and the Booker T. Washington Inspirational Network. It was a delight to hear you speak and an honor to have you attend the education panel we sponsored at the Council for National Policy. Thank you for both. Your presentation inspired me beyond measure and, as I told you, was a model of conviction tempered by humility- a difficult mix. I was impressed that Booker T. Washington's love for education and free enterprise would be tremendously inspiring to our Principle Leaders and I am writing to invite you to speak at our Principle Leadership conference in Virginia Beach, VA for school leaders, families, pastors, board members of Christian schools and those founding private schools. Thank you again for your inspiring speech and I look forward to hearing you again in the future.